We often think of our travels as an 'escape' - have you thought of them as an escape from ... light? Or do you simply love gazing up into the mysteries of the universe, in a clear, clear night sky, unpolluted by man-made lighting? 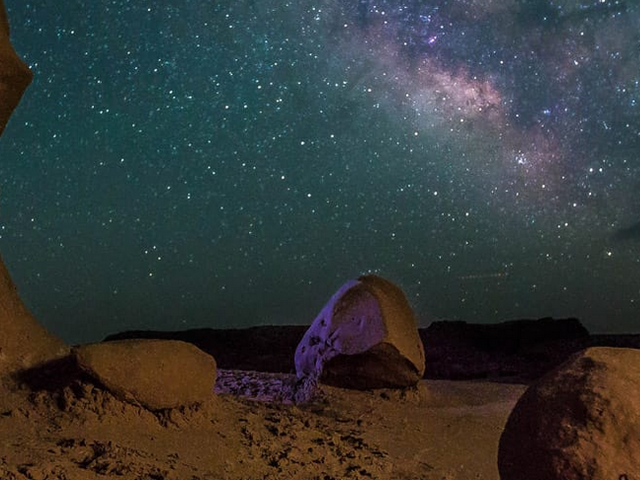 Utah is one of the best places for avid stargazers to celebrate International Dark Sky Week 2017, April 22-28th. Hovenweep National Monument: Until recently best-known for the six groups of ancestral Puebloan villages, there is evidence of occupation from 8,000 to 6,000 B.C. The Monument’s night sky remains about as dark as it was 800 years ago due to its geographic isolation. The Monument’s Rangers offer visitors stargazing programs throughout spring and summer so you can literally see the stars like North America's first peoples did. Weber County North Fork Park: Unlike the majority of International Dark Sky Parks, North Fork Park sets itself apart from the others because of its adjacency to urban areas and its innovative public art incorporating dark skies themes. The International Dark-Sky Association (IDA) is a United States-based non-profit organization incorporated in 1988 by founders David Crawford, a professional astronomer, and Tim Hunter, a physician/amateur astronomer. The mission of the IDA is "to preserve and protect the night time environment and our heritage of dark skies through quality outdoor lighting". To promote awareness about the issues about the disappearing darkness in the world and its effect on human and wildlife wellness, the IDA has an International Dark Sky Places program that aims "to protect locations of exceptional nighttime visages for future generations". Since 2006, it has been designating International Dark-Sky Parks, International Dark-Sky Reserves, and even International Dark-Sky Communities for star gazers and our global natural heritage.